I thoroughly enjoyed the drive to Timahoe as it is situated in a beautiful fertile valley in County Laois. St Mochua founded a monastery here in the 7th century. There are lots of historical references to the monastery, but the only remaining building is the wonderful 12th century round tower. Standing at thirty metres in height, it has four tall windows each facing the cardinal points and three more windows in the drum. This round tower really is a splendid sight. It is quite difficult to view from a distance as it is surrounded by trees, but you can get a fairly good view of the tower from the east. 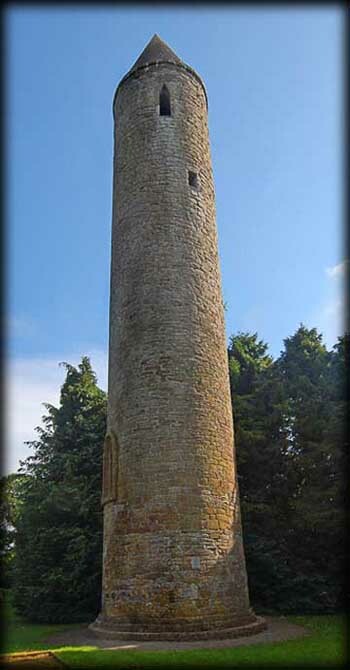 My only regret is I arrived at the site late in the afternoon and the light had gone from the romanesque doorway, the feature that makes this round tower unique from any other round tower in Ireland. The doorway is 4.3 metres up from ground level and is elaborately decorated in the romanesque style, typical of the decoration reserved for churches from that period. The doorway faces east north east and has four orders, two on the outside and two inside and the capitals of the pillars supporting the doorway are beautifully carved with heads, their hair intertwining, which is similar to the capitals at St Saviours, Glendalough and the Romanesque church at Kilteel in Kildare. Also present at the site is a medieval church that was later converted to a castle. It was also difficult to photograph these ruins, but I shall return earlier in the day on my next visit when I hope to get better images of the doorway and the ruined church. Situated: From Portlaoise take the R426 Timahaun rd, then turn right at the T-junction onto the Athleague road still heading south drive for about ten kilometres until you reach the village square at Timahoe. Then turn right onto Water Street. Park here, the round tower is on your left. Discovery Map 55: S5350 9025. Last visit August 2010. Door: Above ground 4.3m. Type: Arched. Windows: Seven. 4 angle headed on the bell storey and 1 angle headed, 1 Round with anglular Frame and 1 lintelled in the drum. 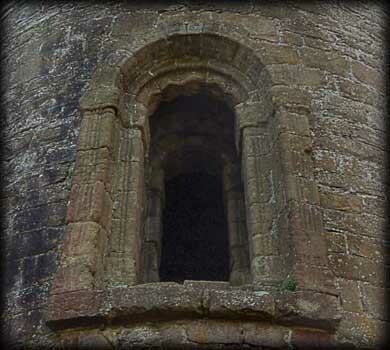 Features: Romanesque decoration on the doorway and triangular window.